Álamos is a town in Álamos Municipality in the Mexican state of Sonora, in northwestern Mexico. The population of the municipality is 24,493 and its area is 6,947.27 square kilometres or 2,682 square miles. President Ernesto Zedillo declared 188 structures in the Colonial City of Alamos as National Historic Monuments on November 23, 2000. The city is in position for being considered a United Nations World Heritage Site of which there are fourteen sites in Mexico. In 2005 Alamos has been named one of a limited number of “Pueblos Magicos” (“Magic Villages”) in Mexico, a special designation that has brought funds for undergrounding the electric wires. Alamos offers more than meets the eye. The town is best explored on foot, sketch book in hand, the curious eye searching out the features of days gone by and the mystery behind the gates of the houses of Alamos. Pursue each cobbled street, seeking out the details that a camera can’t catch. Plaza Guides can fill in the details for the curious. Several professional hunting lodges operate in the Alamos area attracting dove hunters from various areas of the world. In the last decade filming has taken place for one European Endemol production as well as more than 180 episodes of Mexico’s all time number one ‘novela’ (soap opera), ‘La Fuerza del Destino’. The presence of a jet rated airport in Alamos (XALA) is a key factor in attracting aviators from Mexico, the US and Canada on a regular basis. There is also charter service available to some areas of the Copper Canyon. The light in Alamos, Mexico is ideal for painting, especially in the winter because of the consistent light. You can put down your brush and return the next day to the same natural tones. Artists make Alamos their home. Painters, sculptors, photographers and crafts people find inspiration in the architecture, the colorful vines and the greens of the surrounding hills. Groups join to share techniques, paint and sketch. Álamos is located in the southeastern part of Sonora, and 396 km (246 mi) from state capital Hermosillo, 54 km (34 mi) from Navojoa via Sonora State Highway 162, and 663 km (412 mi) from the northern border town of Nogales. Alamos lies in the foothills of the Sierra Madre Occidental. Along the falda (skirt) of the Sierra the fingers of Tropical Deciduous Forest extend up into oak and pine – this ribbon of Dry Tropical vegetation extends along the foothills into Central America. Alamos lies in the most northern limits of Tropical Deciduous Forest in this hemisphere. An abrupt change in elevation occurs from the Sea of Cortez (sea level) to Alamos at 1,346 feet to the Sierra de Alamos rising to 6,700 feet continuing on to the Chihuahua border where the elevation reaches 7,500 feet. This actually covers 70 miles as the crow flies. Álamos has a semi-arid climate bordering on a tropical savanna climate, with three seasons: a hot, dry season from April to June, a hot, humid wet season from July to October, and a warm, generally dry “winter” from November to March. Occasionally the dry winter pattern is interrupted by the passage of frontal cloudbands: 220 millimetres (8.66 in) fell during January 1981, including 168 millimetres (6.61 in) between the fifth and the seventh of that month, and over 120 millimetres (4.72 in) in January 1979. During the hot early summer, temperatures can reach extreme heights; the record being 49.5 °C (121.1 °F) on 16 June 1976. The Tropical Deciduous Forest hosts two climates: a dry temperate time from mid October through June and a wet humid tropical time from July through mid October. The months of November through February are salubrious with days in the 80ºs and nights in the 50ºs. In March the forest drops most of its leaves, the columnar cacti become more prominent like soldiers standing in the forest. In June the humidity builds heralding the coming wet season. On San Juan’s day (June 24) the indigenous people dance and pray to San Juan for rain and blessing of good crops. It almost always rains on this date. The rains are a celebration of life, as the trees burst into leaf, frogs sing and iguanas look for new mates. Monsoon type rains deluge the hills daily. Even though the humidity is high, the temperatures are more stable. The wet season is a time to rejoice. More than 400 species of birds have been recorded from the coast into the foothills at Alamos. Such spectacular birds as the Roseate Spoonbills, McCaws and Trogans exist among the 400. Many birds, mammals, plants and reptiles find their most southern or northern limits in the Alamos region. The Municipality of Álamos derives its name from the Álamo tree. Several impressive specimens are found in one of its two principal plazas, the Alameda. The nearby pueblito, El Sabinito, located within the Municipality, likewise derives its name from a tree, the Sabino. The area was named by the conquistador Francisco Vásquez de Coronado. His expedition of 1540 camped at the confluence of the two major arroyos (Escondido and the Aduana) of present-day Alamos and made reference to local geographical landmarks, including two large rock formations on Mt. Alamos, Los Frailes or ‘the monks’ in English. The church records date to 1682 and the village was incorporated in 1685. 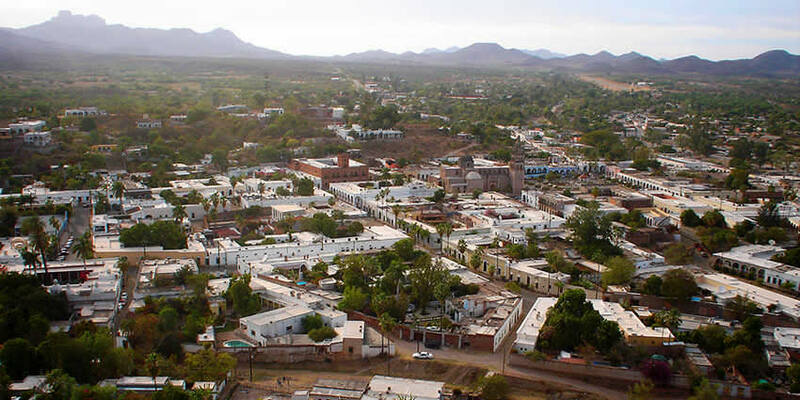 Alamos became the capital of the then state of Occidental in the early 1800s, which encompassed today’s state of Sonora, the northern portion of the state of Sinaloa, as well as some of the Baja California and southern Arizona. Álamos was the northern-most “Silver City” in Mexico and although it has much in common, architecturally, with Mexico’s other “Silver Cities” it has not succumbed to large-scale commercialism and has managed to retain the charm and pace of earlier times. A major expedition departed Alamos in 1775, led by Juan Bautista de Anza II to discover a route to Alta California, and creating the Presidio of Monterey. The Anza expedition had nearly 300 members, of which about half were from Alamos. The trek was heavily financed by the wealthy silver mine owners of Alamos. Álamos is known as “La Ciudad de los Portales” (portales are tall, arched, covered verandas or walkways fronting many of the cobble-stoned streets or calles). Álamos boasts numerous buildings exhibiting classic Andalusian architecture from Mexico’s Colonial period, including numerous mansions, the Plaza de Armas, the Church of La Purísima Concepción, La Capilla and the Palacio Municipal (“city hall”). The great wealth created by the silver mines from the surrounding mining towns of La Aduana, Minas Nuevas and San Bernardo enabled the founders and residents of Álamos to build scores of colonial Spanish mansions throughout the town; most of which went into ruin in the early 20th Century until the late 1940s, when a gradual restoration process began, by Americans and Canadians, which is still ongoing today. Museum of Sonoran History and Culture. Located on the Plaza de Armas, El Museo Costumbrista de Sonora is housed in one of Alamos’ most prestigious colonial homes. The museum houses a fine collection of artifacts depicting colonial life in Alamos as well as the history of mining in this area. The gallery in the Museum is host to many visiting and local artists. At one time this Cultural Center on Guadalupe Hill was the “Carcel”, the jail. Now the Cultural Center serves as educational center as well as an auditorium for public events including expositions, readings, conferences and concerts. The Center is committed to serving the needs of all ages and levels of ability. A collection of artifacts discovered on the original birthplace of Mexico’s legendary and internationally renowned movie actress. Artifacts have been relocated to the private home of Linda Barondes. Leonardo Valdez Esquer – Located in the town of Echojoa between Navojoa and Huatabampo. This museum exhibits a fine collection of folkloric art from all parts of Mexico as well as a complete collection Mayo indian artifacts. Open daily 9:00am to 3:00pm. The Sierra de Álamos Ecological Reserve, offers serious “birding” opportunities. The creek of Cuchujaqui, which is in the ecological reserve is the most species-rich subtropical area in the Northern Hemisphere. Cuchujaqui is the subject of international scientific study and the southern migration destination of hundreds of different species of birds. A characteristic of the more elaborate portal is the arch which provides the perspective through which the building is seen. The cornice is a decorative Greek feature found along the roofline of a structure. Two designs are most prevalent in Alamos, the traditional Greek design which is that of a man’s profile or the ‘pecho de paloma’ profile of a dove’s breast created by the Mexican artisans. Alamos is often referred to as the city of portals. The portal or portico can be found on the interior or exterior of the house and serves as outside living spaces. Columns or arches support the roof. Portales on the exterior were symbols of social status and can be found on the more stately homes on the main thoroughfares. The walls are constructed of adobe and can measure three to four feet in width. This is a perfect example of how the environment influences the design. The thick walls and recessed windows serve to auto regulate temperatures within during the hot summers and cool winters. Windows and doorways in particular show the Andalusian or Moroccan influence on Alamos colonial structures. The Surrounding Area includes the estuaries alive with bird life, Mayo villages, a mining town, rivers where you can take float trips and trails for horseback riding. Tours of colonial homes, the countryside, various silver mines, indigenous villages, coastal estuaries, as well as river float trips are available. Enjoy the Basque tradition of strolling student troubadours, “La Estudiantina” dressed in authentic costumes. About 16 km to the northwest is the Adolfo Ruiz Cortinez Dam and Reservoir known as “El Mocúzarit”, whose waters irrigate 80,000 acres (320 km2). The ten day cultural festival celebrates the life of Dr. Alfonzo Ortiz Tirado, world renowned singer, surgeon, philanthropist and humanist. Dr. Ortiz Tirado, an extraordinary tenor, was a native of Alamos. Alfonso Ortiz Tirado, born in this community in 1894, achieved recognition for being “El Tenor de las Américas”. Each year, during the last ten days of January, Alamos opens its arms to pianists, symphony orchestras, choral groups, quartets, and dancers who entertain at fixed venues throughout the city. Art walks and cultural workshops are presented. Activities are co-ordinated under the auspices of the Instituto Sonorense de Cultura. Also, there is an annual film festival, usually held in March of each year. This annual festival showcases films, performances and hands on workshops over 3 days. Renown Mexican silversmiths demonstrate and display their art, and restaurants offer fine cuisine during this Annual Silver Festival in Alamos, Sonora, Mexico. Silver Classes will be held in conjunction with the festival. See Annual Calendar of Events for this year’s dates. The “Tuna” or Estudiantina is a group of students that join to sing traditional songs using various string and percussion instruments, and dress in students’ clothing of Spain in the 11 to 13 centuries. Alamos is proud of the Estudiantina who lead in song on the grand “callejoneadas”, street processions, during many celebrations. The Mayo tribe is the largest in Mexico. Their biggest fiesta of the year is La Trinidad celebrated May 14th. The celebration starts in Juparé just outside of Huatabampo. It is a continuous celebration with Pascola and Deer Dances followed by a 9-day manda between the two villages of Etchojoa and Juparé. Juparé is easily reached on paved road. Turn right on the boulevard east side of Palacio in Huatabampo, continue on the road about 5 miles to the sign for Juparé. Right turn. The village is about 2 miles along. There is a small museum dedicated to the culture in the village; be sure to stop in just behind the church. A week long celebration is centered around the feast day on December 8 honoring the patron saint of Alamos. Every evening on the Plaza de Armas, you will find regional food booths and entertainment for all. Celebrated on the Friday before Good Friday. Households and neighborhoods throughout town decorate elaborate incendios) or altars that they display in a window or door for all to see. The altars commemorate the suffering of the Mother of Christ. In the evening people stroll the streets viewing the over fifty altars. Miracles are said to happen. Former long time Alamos residents Gloria Mills and Dolores Parker brought the tradition to Alamos from southern Mexico. Hermosillo – Ciudad Obregon: $17-$24 (3:30 hours), buses run hourly. Ciudad Obregon – Navojoa: $6-$13 (0:45 min), buses run hourly. Navojoa – Alamos: $15-$18 (0:50 min), by taxi. Hermosillo – Navajoa: $20-$28 (5:40 hours), buses run each 3 hours. Hermosillo – Alamos: $100-$120 (4:20 hours). Los Mochis – Navojoa: $9-$20 (1:45 hours), buses run every 20 min. Navojoa – Alamos: $15-$18 (0:55 min), by taxi.